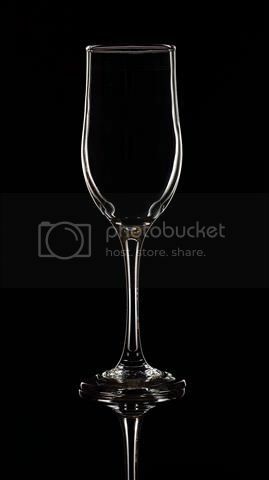 Thanks to members, who gave all the appreciation for my image of a wine glass (http://photographyclubofindia.com/boards/index.php?topic=2166.0) using the Dark Field Lighting technique more so for achieving the rim lighting. On their request I have created this tutorial and I hope others also interested in this genre of photography will find this guidance suitable. Initially I had followed a tutorial from the Net but failed miserably when it came to using white reflectors but further searches led me to easier set ups and I simplified it even further. If you are convinced and feel you can execute it, you may proceed ?..
? Tracing paper (A1 size, 33? x 24? or 84 cms x 60 cms). at least 1 metre space between the wall and the tacing paper, as you have to place a speedlite here.
? Any dark surface (preferably black) to place the wine glasses on in front of the tracing paper. I covered the dining table with a 6? x 10? black backdrop. You can even use bedside tables, a coffee table, etc in front of the tracing paper but ensure it has a black surface.
? A speedlite capable of being activated with wireless triggers. You will also need to place it at the correct height behind the tracing paper. has no role to play in this set up ).
? Needless, to say a DSLR and a suitable lens. I used a 50mm lens. Ensure that the black cardboard is as flat as possible. Cut out a rectangular piece measuring 36 cms wide but retain the length - 84 cms. [Don?t go by what you see in the picture below]. Now fit this black cardboard on to the tracing paper in a manner that it will leave two 12 cm strips of the tracing paper exposed on each side and another strip about 6 cms on the top (as seen in the picture below). You can staple the card on to the tracing paper but if you do not want to damage it, use any other suitable method. It is important that there is no exposed horizontal strip at the bottom of the tracing paper and it is for this reason the length of 84 cms is retained. Keep this contraption aside for the moment. Place one wine glass in the inverted position on the black surface (dining table, side tables, coffee table). 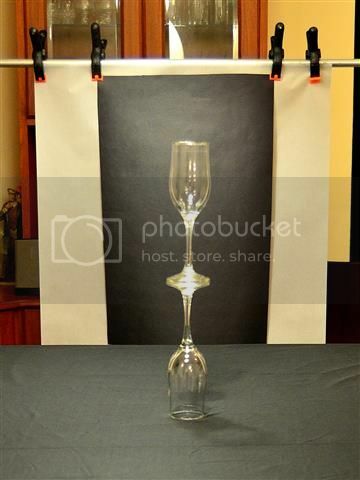 On the foot of this inverted wine glass, place the other wine glass in the upright position. Measure the height created by both the glasses. Let us assume it is 30 cms. Next prepare the ?suspension system? for the tracing paper ? black cardboard combo. The upper edge of the tracing paper should be about 42 ~ 45 cms above the surface on which the wine glasses are going to be placed ? (30 cms + 12 ~ 15 cms). The lower edge of the tracing paper will be well below the black surface. [See pictures below]. Remember if rigging this system in front of a wall, leave a space of at least 1 metre. 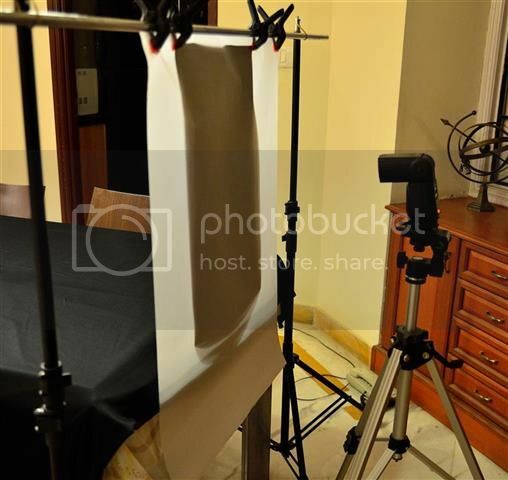 Now place the speedlite behind the tracing paper with the flash head minimum 30 cms away from the tracing paper. Set the power to 1/32. The height of the speedlite?s head can be about half way between the upper edge of the tracing paper and the black surface on which the glasses will be placed. Position the surface(s) [side tables, coffee table ? 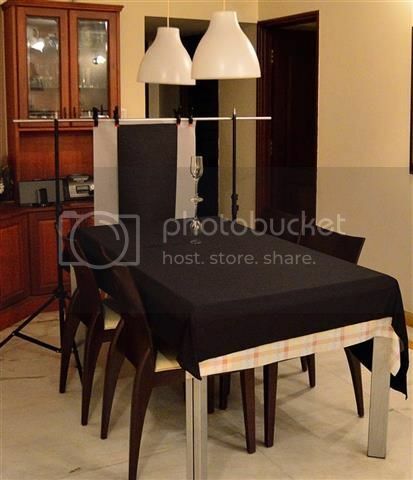 if not using a dining table] in front of the tracing paper so that it touches the tracing paper lightly. Place the wine glasses on the surface now, about 15 cms away from the tracing paper / black cardboard combo. RAW, ISO = 100, WB = Flash, Shutter speed = 1/200s (or the designed sync speed of your camera), Aperture = f/8 . Minimise ambient light. Take a shot. Do not bother if a part of the tracing paper is seen in the image. Your chosen image has to be eventually cropped in post. After taking a shot, check the LCD to see if the edges of the wine glass have a ?rim of light? around. If you are not satisfied then move the wine glasses further away from the tracing paper. You will need to experiment until you get the correct distance from the tracing paper to achieve a perfect rim of light around the wine glass. Further you may have to adjust the distance of the speedlite from the tracing paper and also tweak the power (flash intensities) settings. A tethered camera will be most convenient but it would be advisable to review a set of images on the PC monitor for better detail. 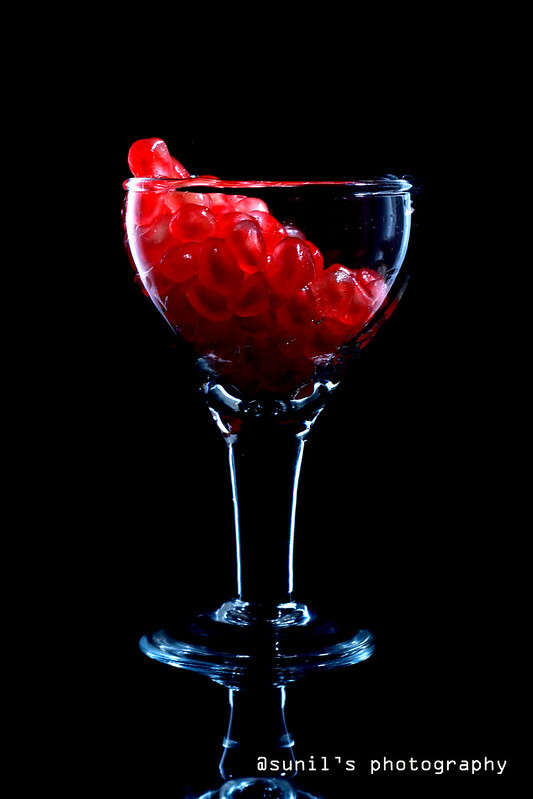 In the event you have placed the wine glasses at the extreme position available and not satisfied with the ?rim light?, then don?t hesitate to extend the ?black surface? by adding additional tables. This is unlikely to happen when using a dining table. There is a possibility that the inverted wine glass may not be ?rimmed? as perfectly as the upright wine glass. The inverted wine glass was placed only to act as an ?artificial? reflection of the upright wine glass . In post you need to crop in a manner to make the ?reflection? look realistic. [See picture below]. Correct tilt if any. Minor sharpening if deemed necessary. Crop in a manner to achieve the final image, as seen above, keeping in mind to include the desired amount the ?artificial reflection?. Yes, some amount of time and effort is required to execute this shot but you will have the satisfaction of having succeeded eventually. In the procedure outlined above, the use of reflectors has been completely avoided. Using reflectors can be quite frustrating as getting the right position is very important besides having the correct size. The exposed strips on the sides of the tracing paper act as ?reflectors? and provides the light to create the rim. Theoretically speaking, the exposed horizontal strip at the upper edge of the tracing paper should provide the rim light for the upper rim of the wine glass but don?t feel disappointed if it does not happen. May be you can experiment with the width of this strip to achieve the rim lighting. The tracing paper has acted as a light diffuser quite like the diffuser panel of a soft box. Experiment with different types of glassware that you have. Don't expect all of then to get 'rimmed'. Plain glass with convex surfaces seems to fare the best. Quality of glass (eg. Waterford ) also plays a role in achieving good 'rimmed' results. 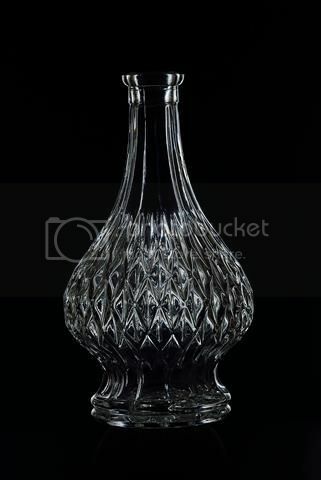 I was personally not too happy with cut crystal glass (See picture below). 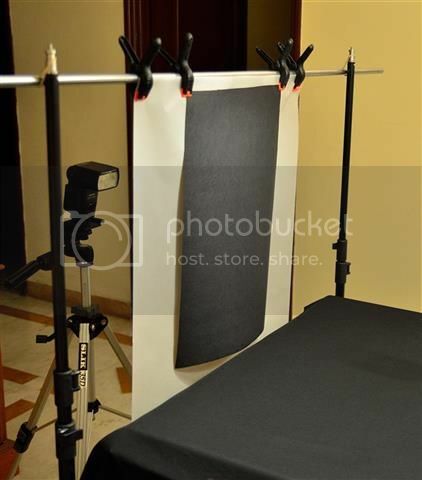 If using a soft box, the same procedure may be followed by placing the black cardboard on the diffuser panel. The modeling light will prove to be very helpful as you can almost pin point the correct position of the wine glasses (on the black surface) where the ?rim? is formed perfectly. Please free to pose any questions that you may have and I will be most happy to advise you further. Vinodji, your patience and effort paid off. Wonderful tutorial!!! That's a very comprehensive write up. Thanks on behalf of all members to take out the time. Many thanks Doc. Happy to contribute. Vinod ji : " Ati Sundar"
You are one incredible gent and am I missing that Karma facility? You bet I am!! It's people like you that makes this fora so so different. Thank you for the efforts and the time. Ps. Do pm me your postal address please, would like to send you some of my bbq sauce as genuine appreciation. Please! I insist!!!!! Very interesting write up with photos that give the reader a fairly good idea of the points being discussed....enjoyed reading it. Jasii Bhai ..... you are one great guy too and a true friend to all in this Forum. Let's not forget all the efforts and pains you are taking for organising the trip to Leh. That is very commendable. My tutorial pales in comparison to what you are doing. Nevertheless, a big Thank You from my side for having praised my tutorial. Thanks a lot Ayaz, for the appreciation. Such indoor strobe related projects can be quite addictive. How did I miss this? Very nice Vinod ji. And the fact that you have shown us a single strobe set up is quite commendable. When I first saw them, I was sure that it was done using your studio strobes but when you showed the results with a single flash, I was really awestruck. Great going. Hoping for more such gems in future from you. Thanks a lot Binoy for the thumbs up ! As mentioned in the tutorial, I had to lay emphasis on a simpler set up mainly sans studio strobes. I hope it will give the nudge to some to go ahead and try it out. Now that you've earned the 'degree' you too should give it a shot. Thanks to you too. Good attempt Sunil. The rim on the stem of the glassware has come out well. I suggest that you post such pictures in the future in the 'Picture Galleries' section and further in the 'Abstract / Strobist / ..... ' sub-section.